It was so good to be back in Montreal. Having lived there for 30 years I feel at home in its environment, and especially in its dance environment. The downtown area is going through a huge refurbishment at the moment. Rising from a building site on Bleury Street is the new Édifice Wilder Espace Danse, a component of what is called the Quartier des Spectacles. In 2017 Édifice Wilder Espace Danse will house the theatre and production houses of Tangente and Agora de la Danse as well as the École de danse contemporaine de Montréal and the studios of my old company, Les Grands Ballets Canadiens. Tangente and Agora de la Danse are production houses for contemporary performance, Tangente producing smaller-scale works. The last performance of Tangente in its temporary home at Monument National is a series of short works on a large scale, Vital Forces (Forces vitales), featuring performances by Greg ‘Krypto’ Selinger, Daniel Wook Jun and Abdel-Hanime ‘Abnormal’ Madini. Selinger accompanies his philosophical musings with a conversational style of breakdance in which the breaking finds a singular harmony with the concepts expressed. Selinger is an engaging character with a ready smile that belies the prodigious strength required of his breaks. His texts suggest a mind constantly questioning; to follow his sources is to enrich our view of life. Albeit comprises a text by Terence McKenna about the true capacity of the human body that Selinger sets out to challenge (McKenna cites breakdance as a trivial example of human discovery); When The Clock Strikes Me is a text by poet and rapper, Saul Williams. One Day Sooner, to a text of his own that covers ‘quantum physics, philosophy of consciousness and futurism’ is a storytelling ‘constructed by the gestures of a body excited and haunted by the words it speaks.’ Selinger’s work radiates out from the body as his words radiate out from the mind, where the joy of movement equates with the joy of thinking. Over and above the formal, physical appeal of contemporary dance, it is this aspect of embarking on a philosophical, spiritual or intellectual journey that can be so rewarding. 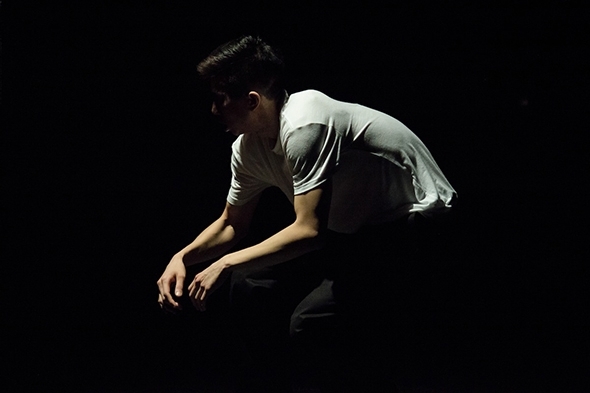 Selinger has made an art of it but his format does not lend itself to an entire evening; the journey takes time to settle in and Selinger’s breakdancing as the visual component of his performative text does not sustain interest outside the scope of the text. Fortunately the program is shared with two other performers in a very different style of hiphop, in a very different package. Daniel Wook Jun and Abdel-Hanine ‘Abnormal’ Madini are two extraordinary poppers who use their own stories as material for their series of performance pieces under the title In Your Presence. Delving into the personal experience, the workings of their individual minds — Labyrinth is described as ‘a wide shot of the grand oceanic serenity of life, and an extreme close up of the internally raging storm’ — could also be inspired by Terence McKenna but here the ideas are internalized, the word expressed exclusively in a physical medium. Labyrinth is a solo for Wook Jun and Madini, each complementing the other as two aspects of experience. The lighting by Benoit Larivière is a key component, with cones of light creating small individual arenas in the darkness into which the dancers emerge and from which they disappear like consciousness and latency. It is their stillness that sets off the physical dialogue of popping and makes it so cooly articulate. Madini speaks of his own experience in Absolution, which he describes as a ‘self-confrontation, self-expression, and metamorphosis.’ The subject is suffering and dance is used to pierce through it, to find a resolution. Madini uses his physical form eloquently like a bravura language, a flow of ideas that keep abstraction at arm’s length. At one point he produces a clown nose whose redness against the black and white is on one level what Roland Barthes in his essay on photography called a punctum; he draws our attention to his face. In the West we point to the heart to indicate self, but in Japanese culture it is the nose that takes on this role. In the Q&A afterwards, led by Hélène Simard, Madini admitted he wasn’t quite sure how to structure the work so he simply followed his inspiration. It worked. Wook Jun’s Injoy is a more complex arrangement, more subtle. He asks the question, ‘What produces the state of joy in the midst of suffering?’ and describes the work as a ‘cycle of seeking and discovery.’ Deeply personal and affecting, Wook Jun uses his own voice and faltering gestures woven into the more assertive popping to become both ‘the subject and object of worship’, manifesting both frailty and doubt, immersion and intellectual distance. Larivière’s lighting cones again create areas through which Wook Jun journeys, laying bare his soul like a pilgrim in search of the unknowable. And that is what links the three works: a sense of movement through time and experience that makes the theatre itself a place of reflection and contemplation. Since endings inevitably contain the seeds of future development, Vital Forces is an auspicious way to mark this transitional phase of Tangente.